As you are no doubt aware, our mission here at the SellingBrew Playbook is to research and disseminate leading-edge practices and innovations in sales operations. So we’re always learning about different approaches, new technologies, changes in focus and priorities, what’s working well right now, what’s not panning out anymore, and so on. But in all of our research, we’ve noticed that there’s one area that doesn’t seem to get a tremendous amount of attention or consideration. Across the thousands of sales operations we reach, the vast majority seem to “revert to defaults” when it comes to sales territories. The default I’m referring to here is the practice of delineating or assigning sales responsibilities by geography—i.e. regions, states, MSAs, zip codes, etc. Now, I suspect that this geographical approach has been so ubiquitous for so long that it just doesn’t occur to most teams to even question it. And it’s become so engrained that no one even considers the possibility that there might be other, more effective ways to allocate sales responsibilities and opportunities. How important is physical proximity these days? Years ago, it was pretty important for salespeople to be within driving distance of their prospects and customers. But with all the advancements in communications and travel…and all the changes in buyer behavior and expectations…is that still the case? For many businesses, it turns out that their customers and prospects actually prefer virtual interactions over in-person meetings and site visits…so proximity just doesn’t matter that much anymore. How are sales opportunities actually distributed? Back before we knew much about the composition of our markets, we had little choice but to use some fairly rudimentary criteria to set boundaries and just hope for adequate and equal coverage. Today, however, we can access a lot more data. And, we can use much more sophisticated processes to map our best targets. As a result, many companies are now discovering that some of their years-old territories were practically barren all along, while others were so brimming with opportunity that the assigned reps had really only been scratching the surface. 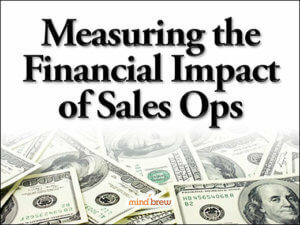 How do sales capabilities vary across the sales team? Of course, we’d like to think that all of our reps are equally capable of closing any type of deal in their purview. But a detailed look at our performance data will usually reveal that the reality is quite different. Due to differences in experience and/or training, certain reps will have much higher win-rates on certain types of deals, while other reps have much higher win-rates on other types of deals. And as discussed in the previous bullet-point, the opportunities within the geographic boundaries we’ve set may not align very well with each sales rep’s true strengths. Asking these questions and more has led some leading sales operations to modify the way they delineate sales responsibilities and allocate opportunities. In some cases, they’re maximizing their win-probabilities by giving certain reps responsibility for certain types of prospects and deals…no matter where they might be located. In other cases, they’re optimizing coverage by using advanced profiling and whitespace analysis to assign prioritized lists of prospects and accounts with the most potential…regardless of their location. The point is that by being willing to question the status quo…and question whether the rationale for certain “defaults” still make sense for their businesses…these teams have discovered yet another opportunity to drive improvement. So, take a look at the defaults in your business. Of course, they might be hard to spot because they’re virtually autonomic at this point. Nevertheless, those things your sales operation does “just because” could represent more opportunities for Sales Ops to innovate and add value. How do you know whether or not the data-driven guidance you're providing to your sales team is as good as it could be...and as good as it really needs to be? In this diagnostic, learn about seven tell-tale signs that your guidance may not be up to par.